Applied Houdini is a production quality oriented series created by Steven Knipping, currently a Senior Rigid Body Destruction / FX Technical Director at Lucasfilm’s Industrial Light & Magic (Star Wars: The Force Awakens, Avengers: Age of Ultron, Tomorrowland). Benefit from production proven workflows while also getting an in depth explanation of why things works they way they do. Best of all – each video is crammed with actual information and footnotes instead of gratuitous talking and dead space. In Dynamics I, we will jump right in and tackle a simulation of a vaporizing pig’s head. We start with simulation fundamentals such as generating initial volumes as well as what exactly domains, vectors, and voxels are. From there we set up a basic simulation with a few forces, cache it, and render it. Tips and tricks including optimal UI organization and a bare bones workflow setup will also be discussed. In Dynamics II, we will immediately move beyond the basics. Rather than start from a static volume, we will dynamically source turbulent density and velocity into our simulation. From there we will control our simulation with a variety of microsolvers including turbulence, disturbance, and diffusion, and even combine multiples of these together for even more advanced effects. Finally, we will talk about the effects that forces, divergence, and vorticity will have on the shape of things. As always, production oriented techniques will take priority and I’ll even share a few of my favorite tips and tricks to achieve quality results faster and more efficiently! In Dynamics III, we will target exactly which Mantra, light, and shader settings you will need to know about in order to produce quick, hi quality renders. Being able to sacrifice minimal quality while gaining massive time savings will be critical to iterating quickly on shots through development, and then switching over to making a great image when you’re done without running out of time. We will also talk about rest texture noise and the shader in general, without which we will not be able to produce photoreal results. Finally, we will learn about scattering and viewing the effects of individual lights in different images, for use with debugging and more importantly later, compositing. In Dynamics IV, we cover the scenarios for dust/smoke/steam/magic most often found in production work – destruction. We begin with basic fracturing and rigid body simulation, as well as secondary particle simulation. 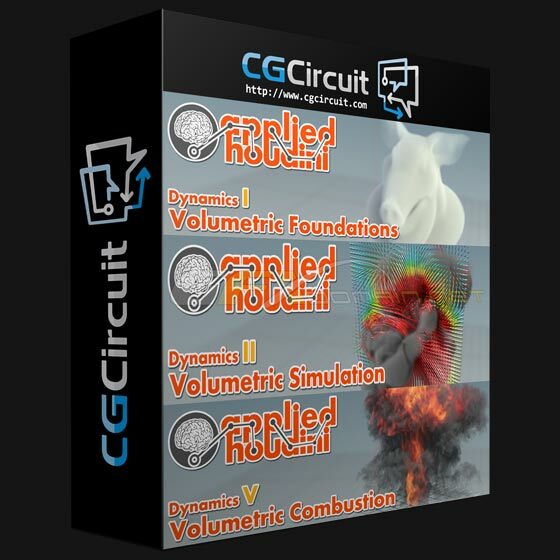 From these we can dynamically source volumes into our smoke sim with characteristics of the fracturing mesh itself. Advanced workflows for speedy collisions, accurate sourcing, and VEX language attribute manipulation are covered in detail.